Black pullover hoody with contrast orange inner hood printed with Hindu Society logo on front left breast. 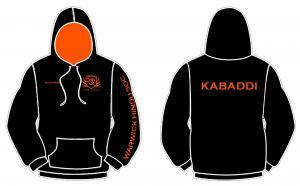 "Warwick Hindu Soc" printed down left arm and "Kabaddi" printed on back. Optional personalisation of a name printed on front right breast.